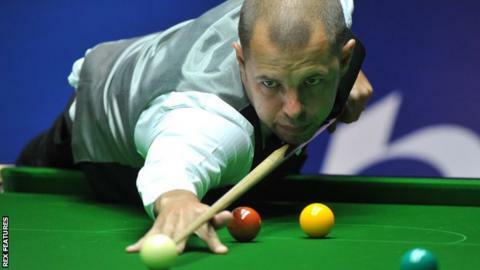 Barry Hawkins says he is lucky to still be in the UK Championship after winning a final-frame decider against veteran amateur Andy Hicks in the first round. Hawkins, the 2013 World Championship runner-up, was 3-1 and 5-4 down but came through 6-5 against the 122nd seed and one-time world number 17. "He completely outplayed me at the start," said Hawkins, the seventh seed. Hicks, 42, said: "It was nip and tuck all the way but I had some unbelievable bad luck in the final frame." Devon-born Hicks, who now lives in Falmouth, reached the World Championship semi-final in 1995 and was a top-32 player as recently as 2007. He turned professional in 1991 but lost his professional tour card in 2013 and now combines playing as an amateur with coaching. He was knocked out in York after losing the deciding frame 55-49. "In all the years I have been playing I don't think I have had such bad luck in the last frame, I really haven't," Hicks said. "Everything went awkward, or I had a kick, and it summed it up at the end when I potted a yellow and went in off on what was probably game ball. It's unbelievable. "I always felt like I was in control in the last frame and when you are playing a top player you feel like you deserve a bit of the run of the ball and I just didn't get it. "I played really well to go 3-1 up. I missed a few in the second half. I wanted to fall over the line and feel like I am in the tournament." Kent's Hawkins, a two-time ranking event winner and former quarter-finalist at the York Barbican, added: "I cant believe I won. Andy was desperately unlucky. "He potted a few balls, didn't land on things and snookered himself. "It was like I was destined to win it. I am just delighted to get through. It was a tough game and Andy is so dangerous. "At the start of the match, he wasn't missing anything. "I would have been devastated to go out. But I managed to claw my way back in to it and I had to pot some good balls in the end to get through."